The disciples are straining at the oars. The current, the wind, perhaps even the sea itself seems against them. Darkness cuts off their vision from the confines of the boat (Mt. 14). Where are they going? Could they even make it there? Will the sea simply overwhelm them? You have read the books, browsed the articles, heard the speakers… and it’s become clear your church must undergo profound changes that respond faithfully to a changing world. But have you seen the gift in the challenge? You are leading in a time of added “permission” and “inspiration” to scan the waters for Jesus! Back to Mt. 14. Does that strained, confused, and even soon-to-be fearful huddle of disciples image the state of affairs in the boat of your church? Is it hard to make out the way forward in the darkness? Does all of your rowing end in fatigue from the current and wind? 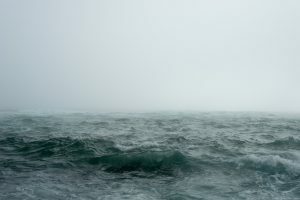 Is the sea you travel simply inhospitable to church? This may speak true for you. And if so, take courage, for it was the stage for one of the disciples’ greatest gifts. “Shortly before dawn Jesus went out to them, walking on the lake” (Mt. 14:25). I’m sure you’ve noticed how change forces us to confront fears. The disciples were not immediately comforted when they saw Jesus out on the water. Actually, they were both “terrified” and “fearful.” And yet, once he hears the Lord’s charge to “Take courage! It is I. Don’t be afraid,” what does Peter say and do? He knocks, and the way is opened. It is the Lord, and he is indeed invited onto the water. Read through this passage in the boat with your leaders. Acknowledge the situation these followers are facing. Name the emotions of the disciples in the boat on Galilee, and the disciples in the room with you. Jesus is on the water. How can we scan the sea for Jesus? How can we be more aware of where Jesus is? In what ways might we need to leave our boat for where he is? What are our unvoiced ideas, that have seemed too radical to say out loud, akin to Peter’s impetus to get out of a boat and walk on water? Peter is on the water. What does it look like to lift up our feet over the side of the boat and get our feet wet? What steps do we need to take starting today? The worst is that we end up in the embrace of Jesus himself, and under the power of his spiritual formation. Change Management Effectiveness Profile: This competency-based questionnaire has been designed to help you understand more about your relative skills or abilities in critical areas. It will give you a picture of your overall ability to demonstrate effective change management. Change Management Skill Builder Booklet: This skill builder can be used as a personal or organizational process to help people walk through major life changes at work or at home. Managing Change Coaching Guide and Storyboard: This storyboard and coaching guide use a four-step approach to change management. Coaches will find this a helpful resource to help steer people through major change in their lives at work or in the home.